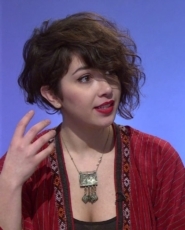 Sahar Zand is a young award-winning FAP Runner up British/Iranian presenter and journalist who specialises in showing what the world looks and sounds like, bringing to surface unique stories that would otherwise remain unreported. She’s worked across the BBC, Channel 4 and a range of international broadcasters covering breaking news, live events and in depth investigations in some of the world’s most hostile environments. Her work for Television, Radio and Digital has taken her around the world to countries like Afghanistan, Nepal, Indonesia and Syria. The stories she covers – mostly generated and developed by herself – are powerful, captivating and different – Living with the dead, Living in Afghanistan’s only secure psychiatric unit, #metoo in Bollywood, Mothers in US Jails, Living Goddess, Iran’s Nuclear deal, Swimming the English Channel and The Moroccan warrior women beating men at their own games. As a programme maker and presenter, Sahar’s career has been focused on creating unique content for under-served audiences especially younger, female and those from diverse backgrounds. Her work in some ways reflects the diverse nature of her life. Born in Iran Sahar was a refugee being smuggled across the world and living as a child in refugee camps. Finally settling in the UK at the age of 15, her single mother struggled with poverty living in council flats in Glasgow, Peterborough and London. Her work now often gives a voice to those who otherwise remain invisible, and her own childhood story is being made into a documentary film for BBC’s Storyville. She’s at home fronting programs from war zones to the Oxford Literary Festival. Her documentaries and reports have been viewed millions of times online, some presented, produced, filmed, and edited entirely by herself. She was also behind the creation of BBC’s Solution Focused Journalism unit: World Hacks. Sahar’s prominence as a disruptive, creative and distinguished journalist of the digital age has put her in high demand to regularly give talks at festivals and universities around the world about journalism, storytelling and film-making. Sahar is also a guest lecturer at the university of West London and often involved in moderating conferences and chairing panels. Sahar is fluent in 4 languages including Farsi, Tajiki and Dari. She also speaks basic Arabic.